Roseberry Topping is an unusual landmark on the skyline overlooking Teesside. Known as Yorkshire's Matterhorn, it has a hard sandstone cap which has protected the underlying shales and clays, so while the surrounding area was worn away by ice, wind and rain, the Topping survived. Its dramatic summit was partly created by man; alum, jet and ironstone have all been mined out of the hill, and ironstone workings caused the collapse of the western face in 1912. While many visitors come to conquer the hill, there's plenty more to do besides with a fantastic array of habitats to discover. 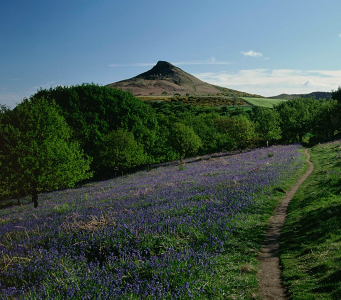 Explore bluebell woods, heather moorland, the open expanses of Roseberry Common and a long abandoned quarry. 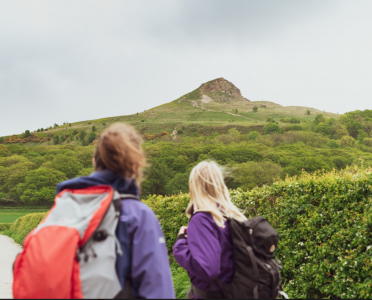 Visit Roseberry Topping on the Roseberry Topping to Great Ayton Circuit. Visit the Top Ten Trail Experiences website to find out more and download a leaflet.